Recent revelations regarding Facebook’s complicit role in unauthorized sharing (selling) of it’s users data with 3rd party companies as well as the enormous propaganda machine the social media giant turned a blind eye to during the 2016 presidential campaign have caused me to take serious issue with the social media platform. To be fair, Facebook & I had already been sharing an estranged, on & off again relationship over the past 10 years or so - I guess I’d long since fallen out of love with many things people chose to share & perhaps more importantly, my (admittedly) presumed reasoning for their doing so. What once seemed like an excellent way to keep in touch with (or tabs on) friends, now very much feels like a never-ending competition among co-workers, peers & family members alike. I hate having to witness the brazen insensitivity of folk when it comes to relationship issues, death announcements & other handle-with-care posts of the like. None of the rude comments, jealous reactions, or First 48 theories do anything to enhance my quality of life, so I’m simply choosing not to partake. But it was really the weaponization of Facebook in recent years, by both foreign & domestic players alike, to further sew decent, hate & bigotry into the very fabric of our democracy that pissed me off. On top of that, its just hurtful to know there are so many among us who absolutely refuse to see any issue from a perspective different than their own. It’s recently been estimated that about 50% of Americans get their news from Facebook. Yes, an unregulated, ad driven, unverified news saturated & highly politicized social media website is now responsible for how roughly half of US citizens obtain news content - just think about that. In some ways, I guess its all a not so friendly reminder of the work we have left to do in this country. Still, the general lack of accountability that Facebook CEO Mark Zuckerberg has shown before, during & since the past presidential campaign when paired with recent trends of cyber-bullying, suicide posts & racial stand-offs have all left a bad taste in my mouth. 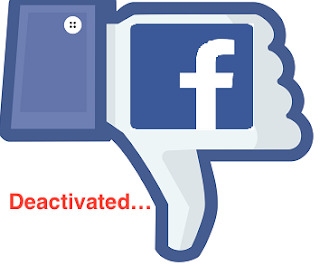 Moving forward, I anticipate using Facebook as more of an emergency telephone book of sort… if absolutely necessary, I can always reactivate my account with the sole intention of retrieving pertinent information regarding friends & deactivate immediately afterward. Otherwise, I really don’t expect to miss it much, if at all.